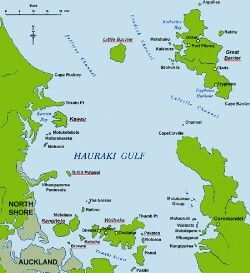 Great Barrier Island is about 80 Km NE of Auckland city, in the Hauraki Gulf. It is far enough away from the urban sprawl to avoid the city troubles, and is an unexpected gem with forests, beaches, hot springs and a fjord as one of its harbours. Historically it was important for the kauri timber cut from it, and later for gold and silver. Now the forest is returning, and the rare birds and bats are slowly returning. On the top of the main mountain oceanic petrels come to nest in the spring months, while on one of the small islets to the west a gannet rookery has long been established. To the west is Little Barrier Island, a restricted access National Park that harbours some of the rarest birds in the world. Comments: Wife of William Alcock (snr). Comments: Spouse of Susanna Alcock. Comments: Son of Susanna & William Alcock.